The production of crablets has been started in the newly established crab hatchery in Shyam nagar Satkhira with the financial assistance of Palli Karma-Shayak Foundation (PKSF). This is the first ever successful crab hatchery in Bangladesh. The hatchery has been established through Nowabenki Gonomukhi Foundation (NGF) a partner organization of PKSF under the project titled ‘Promoting Agricultural Commercialization and Enterprises (PACE) Project jointly financed by PKSF and International Fund for Agricultural Development (IFAD). The first batch of crablets produced in the hatchery was released to nursery ponds on 25th February 2017. Mr. Md. Fazlul Kader, Deputy Managing Director (Programme), PKSF formally released crablets in a nursery pond. 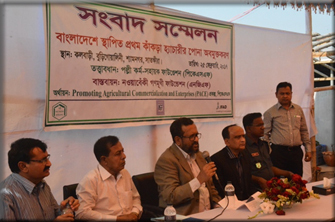 Speaking on the occasion, Mr. Fazlul Kader expressed his satisfaction over the success of the hatchery in producing quality crablets and expected that the hatchery will have far reaching impact in the expansion of this promising export oriented sector. He mentioned that attempts will be taken for setting up small-scale crab hatcheries at the household levels through microentrepreneurs to meet the increasing demand of crablets of the crab culture sector flourishing in southern coastal regions of the country. Mr. Akond Md. Rafiqul Islam, Project Coordinator of PACE project was present on the occasion. The crab hatchery technology was transferred to Bangladesh by a Vietnamese development organization ‘Center for Education and Community Development (CECD)’ which is led by Ms. Pham Thi Hong. Earlier, Dr. Qazi Kholiquzzaman Ahmad, Chairman of PKSF laid the foundation stone of the hatchery on 6th April 2016 through a video conference. After the completion of experimental production, Dr. Qazi Kholiquzzaman Ahmad released the crablets into a nursery pond on 27th August 2016. Mr. Md. Abdul Karim, Managing Director of PKSF was present on the occasion. The experimental production was done under the direct technical supervision of the Vietnamese experts.